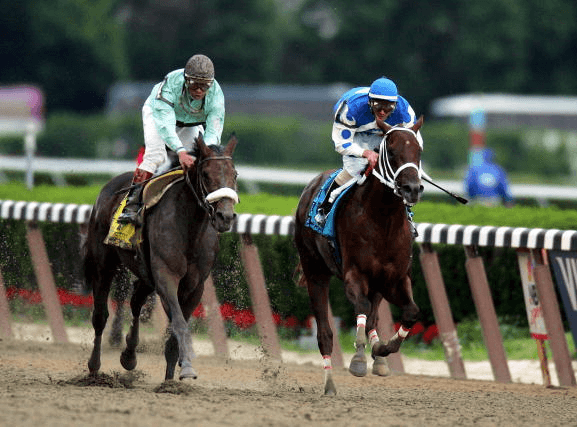 Ultimate Belmont Stakes Betting Guide. 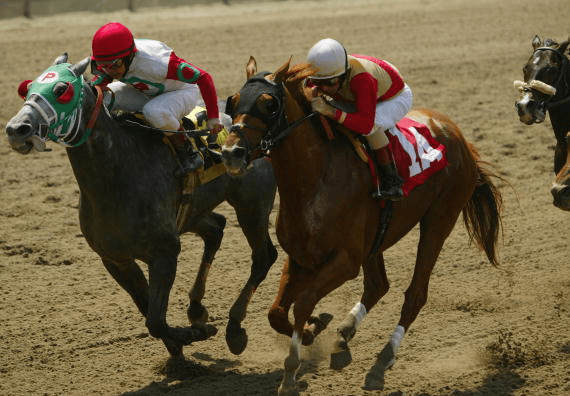 Learn how to bet on the Belmont Stakes. See last year’s video and hear the greatest Belmont call ever. Learn simple Belmont bets. Read about the Belmont Stakes’ biggest long-shot wins. Keep reading. The Belmont Stakes is 5 weeks after the Kentucky Derby and 2 weeks after the Preakness. Profit from these Belmont Betting options. Pick both the Gold Cup Invitational and Belmont Stakes winners. Make your picks before the Gold Cup begins. Post time is 5:46 PM the Friday before the Belmont Stakes. The 2 mile Gold Cup Invitational is for 4+ year old horses. The purse is $400,000. It is a Grade 2 race. Race books determine Gold Cup and Belmont Stakes Daily Double payouts from each horse’s odds of winning its respective event. Review the Gold Cup Invitational-Belmont Stakes will-pays after the Gold Cup has concluded. Payouts include the Gold Cup winner paired with each Belmont Stakes horse. Odds may change up until Belmont Stakes post time. Review each horse’s most recent race results. Horses will not compete between the Preakness and Belmont Stakes races. Select horses to key into the first, second, third and fourth position. Each key contains one or more horses. Final order does matter. The average Belmont Stakes field is 10 horses. The initial field might be 12 or more. But injuries and last-minute scratches will narrow the field. Each key should have 4 horses or fewer. Select horses most likely to finish in the top 4. Also include a couple less probable horses. It’s not uncommon to see longshots finish third or fourth. Ensure your bet accounts for these possibilities. Horses A,B & C in the first position. Horses A,B + Horse D in the second position. Do not include C.
Horses A,D + Horse E in the third position. Do not include B or C.
Horses B,C,E + Horse F in the fourth position. Do not include A or D.
Total unique Horses: 6 (A,B,C,D,E,F). Each combination costs $1. Total cost is $33 for 33 combinations. Note: Superfecta wheel costs will vary depending on the number of unique horses. Using the same horse in multiple keys decreases cost. Adding new horses to each key increases cost. Superfecta Part Wheels cost less than a Superfecta Box. They are also more efficient. You will bet less to potentially win more money. 3. Belmont Stakes Win Place Show Bet. Also called “Across the Board”. Pick from the top 5-7 contenders. Don’t bet longshot horses unless you’re extremely confident. Avoid placing multiple Win-Place-Show bets. Consider a Trifecta or Superfecta box bet instead. The 10+ horse Belmont field makes picking a winner much easier than the Kentucky Derby. Bettors should minimize risk and diversify their bets whenever possible. Play 2 horses at once with the Quinella Bet. Pick 2 horses. These horses must finish first and second. Final order does not matter. Your bet wins if the horses finish first and second in any order. The Quinella bet minimum is $2. The maximum is commonly $500. Bet the track minimum. Place no more than 3 Quinella bets on different horses. One winning Quinella justifies a $6 expense on 3 separate $2 bets. You could profit substantially. Deposit early Belmont Stakes week. Consider using Bitcoin or other cryptocurrencies. You’ll avoid last minute credit card processing glitches. 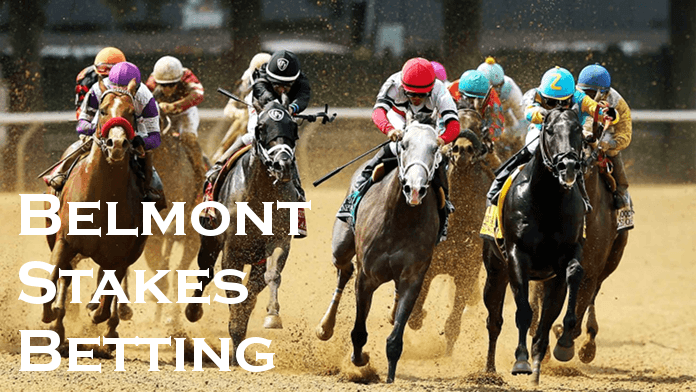 Monitor Belmont Stakes Betting odds. Visit your online race book’s odds page regularly. Odds will change up until post time. Shop Belmont betting odds at multiple sportsbooks. Sarava’s early racing attempts weren’t promising. He raced in England as a 2-year-old. There he started 3 races and won none. Then Sarava returned to the USA in 2002. He did better under trainer Kenneth McPeek. Jockey Edgar Prado mounted him for Pimlico’s 2002 Sir Barton Stakes. This time Sarava came through. He won handily by 4 lengths. Now it was time for the 2002 Belmont Stakes. Triple Crown hopeful War Emblem was the heavy favorite after comfortable wins at the Kentucky Derby and Preakness. Would Sarava be the spoiler at 70 to 1? War Emblem suffered an awkward start but managed to recover as the homestretch approached. Meanwhile Medaglia d’Oro and Sarava loomed to the outside. But War Emblem tired turning for home. Both Medaglia d’Oro and Sarava charged ahead. Sarava remained about ½ length ahead, never fading as he crossed the finish. The biggest longshot in Belmont Stakes history had won. Sarava retired to stud in 2005. Jockey Edgar Prado would go on to win another Belmont Stakes aboard another longshot, Birdstone, in 2004. Da’Tara was 9th in the 2008 Florida Derby, some 23½ lengths behind. He finished 5th in the Pat Day Mile Stakes. Then he finished second in the Barbaro Stakes. Were these results suggestive of a future Belmont Stakes winner? Not at 38 to 1 odds. And not with Big Brown lining up a few stalls over, gunning for the Triple Crown. Big Brown went into the 2008 Belmont Stakes undefeated. His runaway Kentucky Derby and Preakness wins easily made him the odds-on favorite. Da’Tara and jockey Alan Garcia had other plans. Breaking from the start, Garcia guided Da’Tara to the front well before the clubhouse turn. Big Brown fell in behind. The first mile was a leisurely 1:37.96. Big Brown fans were hoping he’d overtake Da’Tara turning for home. The pace wasn’t too fast. But Da’Tara maintained his improbable lead as Big Brown’s jockey, Kent Desormeaux eased him up. Desormeaux later stated, “I had no horse”. Da’Tara surged for the finish holding off a late charge from Denis of Cork. Da’Tara never won another race after the 2008 Belmont Stakes. He was sold to various farms. A 2011 attempt to restart training was unproductive. He retired to stud and was relocated to Venezuela. An eighth-place finish at the 2004 Kentucky Derby kept Birdstone out of the limelight. He was also absent at the subsequent Preakness Stakes. Birdstone was understandably given long odds heading into the Belmont. He hadn’t won a single race since his sophomore year. Moreover, Kentucky Derby and Preakness winner Smarty Jones would be attempting to win the Triple Crown. Smarty Jones was the heavy favorite when the gates opened at Belmont Park. He rode in a small pack, moving into the lead with 5 furlongs to go. Birdstone trailed quietly behind. He moved into fourth as the backstretch concluded. Then he moved into second as the horses turned for home. Victory was in Smarty Jones’ grasp. But a stubborn Birdstone came up on the outside seemingly unfazed by the race’s grueling distance. He overtook Smarty Jones with a late surge and never looked back. The Triple Crown drought would continue. Jockey Edgar Prado won his second Belmont. Trainer Nick Zito won his first, eventually winning 4 years later with another longshot, Da’Tara. Birdstone later won the 2004 Traver’s Stakes and was forced to retire when a fracture was discovered following a seventh-place finish at the Breeder’s Cup. Afterward Birdstone sired multiple noteworthy racehorses, including Summer Bird, Mine that Bird and Noble Bird. Maybe Temperence Hill should have run the 1980 Kentucky Derby and Preakness Stakes. Upon retirement in 1981 his record had all the trimmings of a successful racehorse, winning multiple Grade 1 races and earning $1,567,650. Temperence Hill had wins in the 1980 Rebel Stakes and Arkansas Derby. Both events are Kentucky Derby prep races. After a lackluster May, Temperence Hill made his appearance at the June Belmont Stakes. There he lined up with Derby winner and favorite Genuine Risk. Preakness winner Codex joined them. A Belmont Stakes win would have been sweet revenge for the filly Genuine Risk. Many considered her Preakness loss controversial after eventual winner Codex drifted into her lane on the homestretch. Genuine Risk nearly won the Belmont. She patiently ran in the top 3, taking the lead with a tepid surge as the finish approached. But Temperence Hill had hung on and came up on the weary filly from the outside. He surged ahead crossing the finish, winning by 2 lengths. Temperence hill went on to win the 1980 Traver’s Stakes, Jockey Club Gold Cup and Louisiana Down’s first Super Derby. He won the 1981 Suburban, Oaklawn and Razorback Handicaps as a 4-year-old. Sherluck’s win at the 1961 Blue Grass stakes led him to the 1961 Kentucky Derby and Preakness. He finished fifth in both races to Carry Back with jockey Eddie Arcaro at the Derby and Sam Boulmetis at the Preakness. Now future hall of famer Braulio Baeza would ride him in Belmont Stakes. Carry Back began the 1961 Belmont Stakes the same as always, a late starter with a strong finish. This race, however, would be different. He languished on the backstretch, never making a big move to the front. Instead it was Sherluck and Globemaster dueling for the finish, with Sherluck charging ahead to win by 2¼ lengths. He was the biggest longshot winner in the history of the Belmont Stakes until Sarava won at 70 to 1 odds in 2002. Coincidently both Sherluck and Sarava vanquished the Triple Crown hopes of Carry Back and War Emblem, respectively. Sherluck defeated Carry Back again in October 1961’s Lawrence Realization Stakes at Belmont Park. His last win came in November at Aqueduct Racetrack’s Roamer Handicap.